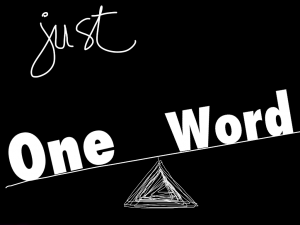 As the final days of December descend upon us, I am once again reminded of the annual Twitter phenomenon of selecting #oneword which will become one’s mantra for the coming year. In 2016, I selected “Unwritten” following a moving rendition of Natasha Bedingfield’s song of the same title, sung by a member of the worship team at church. I challenged myself to be anything but unwritten. As I continue to remind myself, writing is a muscle that needs to be flexed on a regular basis if one is ever expected to get better at it. A great reminder for me, as that muscle has been less than flexed during the past four months. I will do better this coming year. In 2017, my #oneword was “Imagine”. With my impending transition from a system role to leading a staff with the opening of a brand new school, I wanted 2017 to be filled with all of the possibilities of what such a gift could entail. As I reread that post, I am proud that the staff that was selected for our new school have already started to embrace many of those imaginings. A year ago, I did not know 80% of these educators and in 4 short months they have taught me so much about effective pedagogy, creating a community of learners and they have embraced the ever-changing, ever-evolving world of SAC. I could never have imagined being surrounded by such incredible, caring and dedicated educators and loving coming to work as much as I do now! As I look forward to 2018, the word that I’m going to select is one that was planted in my spirit by my incoming Vice Principal, Matt Lynds. As we went through the process of selecting a mascot for our new school, he came up with the word, Courage ~ and although the school community eventually selected the SAC Coyotes, along with a design, beautifully crafted by one of our students, I haven’t been able to shake the power of that word. Now that our world at SAC is starting to resemble a fully functional school, rather than a construction zone, we can begin to focus on those decisions which are a combination of exciting and challenging at the same time. It will take Courage to challenge the status quo when it comes to recognizing students at assemblies and graduations. It will take Courage to continue to support both educators and parents to embrace the power of digital portfolios. It will take Courage to refuse to condone practices which do not challenge our students to reach their potential. There is a reason why we call them “Courageous Conversations”. 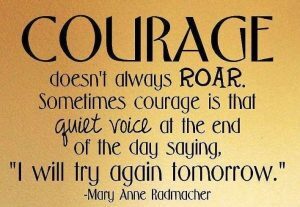 It will take Courage to constantly ensure that I’m pushing myself out of my comfort zone. It will take Courage to stay true to the decision to purchase flexible furniture and to continue to ask those essential questions to our team. It will take Courage to continually challenge an already highly motivated and exceptional staff to continue to learn more, inspire more, be more. It will take Courage to intentionally mentor a new VP with a different mindset as to what the job could and should entail and to fight the urge to do things the way they have always been done, just because it’s easier. Just like my two previous #oneword posts, I have no doubt that the upcoming year will bring many more opportunities for me to experience my #oneword mantra in ways that I have yet to imagine. As you look forward to 2018, what will your #oneword be? A great post and a powerful #Oneword for 2018. Those Courageous Conversations are challenging but imperitive. I know I need to be more courageous receiving them. I am excited & hesitant about my first Crucial Conversation meeting next month. I’ll think about your list as it approaches. It is always such a pleasure to read your posts, Sue. Your ideas flow with ease and reveal this confident-vulnerability… that inspires every time. So many of us long to write, far more frequently than we actually do. So I do appreciate when you share the ‘yearning/longing/regret’ for not writing.